The Ice Wolves that lope along the White River of northeast Skyrim are associated with both the goddess Mara and the Wolf Totem of Atmora - but it's mighty hard to think of their mythic stature when you're rolling around in the snow with an Ice Wolf Puppy! The White River Ice Wolf Pup was available in the Crown Store for 1,000 for a limited time, and in the Flame Atronach Crown Crates as a Legendary-level reward. Its default name is "Wurf". The White-Gold Imperial Pony was said to have made its debut as the birthday present for a noble's daughter, though which family claims this prestige is still hotly debated throughout Cyrodiil. 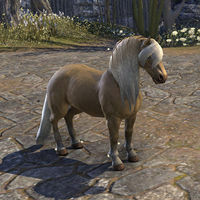 White-Gold Imperial Ponies were available from the Crown Store for 010001,000 . Its default name is "Goldie". 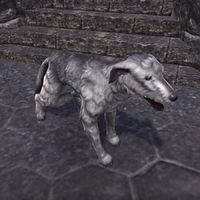 The Whiterun Wolfhound is a gray wolfhound dog that was given to players who ordered the Imperial Edition on Steam before July 21st, 2014. It also comes with the purchase of the official Elder Scrolls Online Nord figurine from Symbiote Studios (redeemable only on PC/Mac; not to be confused with the Pop! Vinyl Nord figurine). Its default name is "Horker". 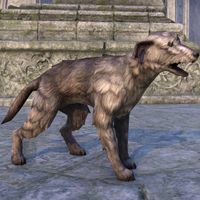 The Windhelm Wolfhound is a brown wolfhound dog that is available from the Crown Store for 400 , or as part of the various Starter Pack bundles that have been released. Its default name is "Wurfles". 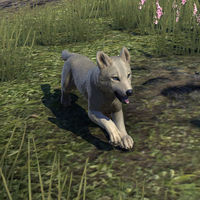 The pet was originally announced as the "Riften Wolfhound" following player feedback after the release of the Whiterun Wolfhound on Steam. North of Windhelm in Skyrim, where the snow on the heights never melts, the Nords' great Wolfhounds have lighter and fluffier fur coats. In addition to barking, they even howl a bit like the wolves they pursue. The Winterhold Wolfhound is a pet that is available as an Epic-level reward in Dragonscale Crown Crates. Its default name is "Drift Dog". The Wolf-Lizard Pup is simply adorable when it tries to howl, just hisses instead, and looks ever so confused. The Wolf-Lizard Pup is an upcoming pet. Its default name is "Hissy Howl". The Orcs of Wrothgar have a hardy breed of goats well-suited to the area's rugged terrain and changeable climate. Each goatherd particularly prizes his herd's master Buck Goat; these tend to be both intelligent and pugnacious, good animal companions. 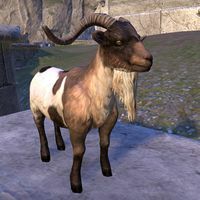 The Wrothgar Buck Goat is available from the Crown Store for 700 . Its default name is "Billy". This page was last modified on 30 March 2019, at 03:47.